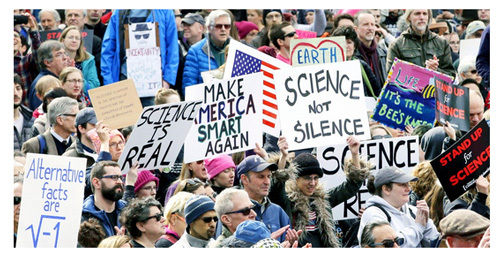 Hundreds of scientists gathered in Boston’s Copley Square on Sunday to “stand up for science,” marking the latest protest in a wave of outspoken political engagement from scientists in reaction to the Trump administration. The rally, timed to coincide with the annual American Association for the Advancement of Science meeting in Boston, brought together concerned scientists and activists from across the country. 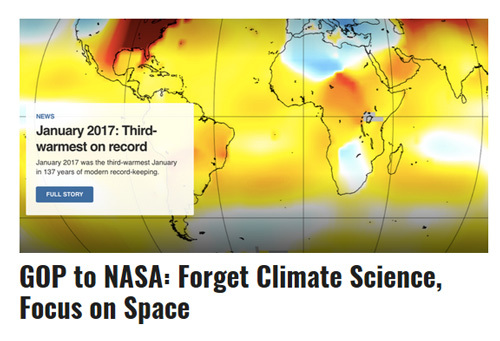 For years, Republican lawmakers have tried to scrap NASA‘s climate change research in favor of space exploration, but with President Trump and his cabinet of climate skeptics now in control, the space agency’s earth sciences budget could finally be on the chopping block. Rep. Lamar Smith (R-Texas), the notoriously science-averse chairman of the House Committee on Science, Space and Technology, told E&E News he wants a “rebalancing” of NASA’s mission. The Trump administration is expected to begin attacks on the U.S. Environmental Protection Agency (EPA) and climate science at the executive level now that the administration has a leader in place at the agency. 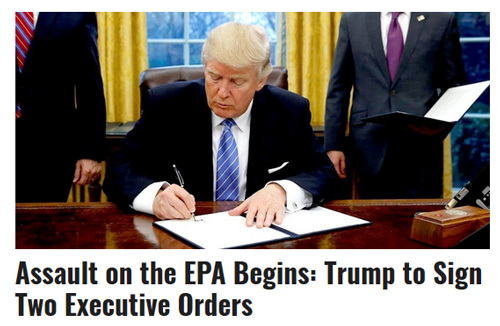 Multiple outlets have reported that President Trump may be planning a visit to EPA headquarters as early as this week, where he could sign executive orders targeting Obama administration climate policies and the agency’s structure. The Washington Post added additional details yesterday evening, reporting that two executive orders being prepared target the Clean Power Plan and the Waters of the U.S rule for a revamp, while also lifting a moratorium on coal leasing on federal land. Congress is keeping busy with climate rollbacks too, as the Senate eyes a vote on methane regulations this week. One executive order—which the Trump administration will couch as reducing U.S. dependence on other countries for energy—will instruct the Environmental Protection Agency to begin rewriting the 2015 regulation that limits greenhouse-gas emissions from existing electric utilities. It also instructs the Interior Department’s Bureau of Land Management (BLM) to lift a moratorium on federal coal leasing. A second order will instruct the EPA and Army Corps of Engineers to revamp a 2015 rule, known as the Waters of the United States rule, that applies to 60 percent of the water bodies in the country. That regulation was issued under the 1972 Clean Water Act, which gives the federal government authority over not only major water bodies but also the wetlands, rivers and streams that feed into them. It affects development as well as some farming operations on the grounds that these activities could pollute the smaller or intermittent bodies of water that flow into major ones. 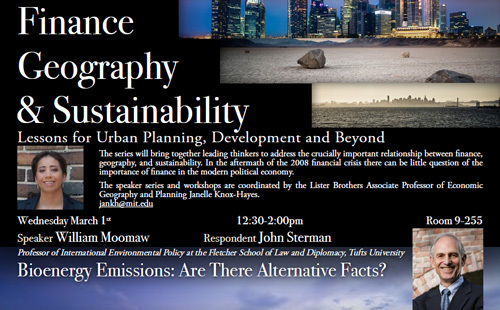 Professor William Moonmaw, Professor of International Environmental Policy at the Fletcher School of Law and Diplomacy at Tufts University will lead a discussion as part of the Finance, Geography, and Sustainability Speaker Series. He will discuss Bio Energy Emissions. 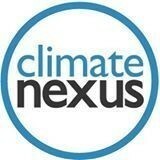 Bioenergy has entered the renewable energy strategy for addressing climate change. It contributes the largest fraction of renewable energy world wide, and is 60% of the renewable portfolio in the European Union. However, bioenergy is a high carbon emitting renewable with thermal carbon emission intensity comparable to coal. Yet the EU and most US states count bioenergy emissions as having zero emissions. The US Congress attempted to implement a carbon neutral amendment for forest bioenergy that is used in electric power generation. That was challenged by a group of 65 scientists and three scientific societies, and the energy bill failed to be enacted. The Paris agreement was facilitated by claims that bioenergy with carbon capture and storage could assure meeting the stringent temperature limitation goals although no such technology has been demonstrated commercially. There are at least four alternative means being used to account for bioenergy emissions, and they are contradictory. Are these “alternative facts?” Resolving this disagreement and correctly accounting for bioenergy emissions is essential to developing strategies and creating policies and actions that will lower greenhouse gas emissions. Naomi Ages, Greenpeace USA. Scott Pruitt has made it clear he wants to destroy the Environmental Protection Agency, and now Trump and the Republicans in Congress have put him in charge. What You Didn’t Know About Soil…But Should! David Halperin, Republic Report & Huffington Post & Eleanor Goldfield, Act Out!-Occupy.com. Are this weekend’s town hall protests the sign of an emerging liberal tea party? The panel also gets into, the “lying press,” TrumpCare and the future of the Democratic Party.